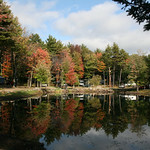 September 29 - October 10, 2009 / Northwood, New Hampshire -- We are at one of our favorite RV parks, Saddleback Campground in Northwood, NH, just east of Concord, the capitol. This will be home for nearly the first 2 weeks of October at which point we will be only a short distance south in Salem, Mass. One of our favorites, but no sewer hookups.